French riot police take position in front of protesters wearing yellow vests (gilets jaunes) demonstrating against rising costs of living they blame on high taxes on the Champs-Elysees in Paris, Dec. 15, 2018. Police fired tear gas to disperse "yellow vest" demonstrators who converged on central Paris Saturday for the fifth straight weekend to protest the high cost of living and their belief President Emmanuel Macron is out of touch with working people. Scuffles erupted between protesters and police, who fired tear gas on demonstrators as they scurried down side streets of Paris' famed Champs-Elysees boulevard. Sixty people had been arrested in the capital by late Saturday morning, fewer than the 500 that had been detained at the same time last weekend, the local government said. Some 8,000 police and 14 armored vehicles were deployed to prevent a repeat of previous protests that turned violent, with protesters looting stores and setting up burning barricades in the streets. 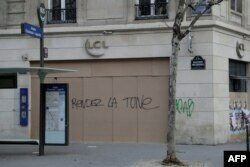 The words "Give back the money" are written on the facade of a bank in Paris, Dec. 15, 2018, as protesters wearing yellow vests arrive to demonstrate against rising costs of living they blame on high taxes. Macron has since abandoned the fuel tax hikes and hopes a package of tax and minimum wage measures will help ease tensions in the country after a month of violent clashes. Government officials are concerned that repeated outbreaks of violence would weaken the economy and raise doubts about the government's survival.